If You Want To Need A Genuine Rank In Search Rankings You NEED High quality And High PR Backlinks . 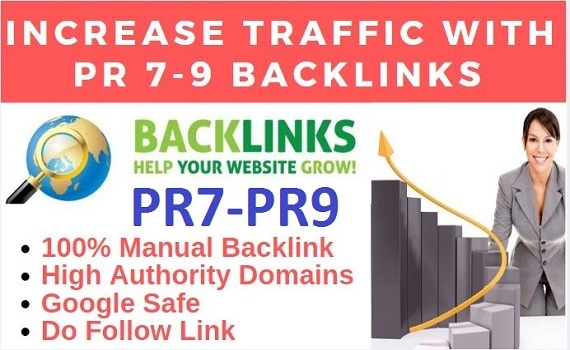 These High Quality Page Ranking Backlinks Are Very Effective For Boost Your Page Rank & Increase Real Traffic. Truly, A Backlink Starting From A PR 9 Site Is More Powerful Than A Link Build On A PR 1 Website. A PR 9 Site Is Uncommon On The Web, And Getting One Of Them To Link Back To Your Website Is Such A Challenging Task That Even I Myself Am Struggling With It! Its Not Only Quality And Authority But Ranking Improvements. ........... If You Have Any Question Regarding The Service Feel Free To Contact Me.